Flat surfaces are easy to clean, right? Sometimes they are, but depending upon what is on the surfaces, even these flat surfaces may take some time and attention in getting them clean. Using a water broom attachment with your pressure washer can help you cut the time that it takes to clean that flat surface and it can make it much easier for you physically. If you clean flat surfaces like your driveways, sidewalks, rooftops, decks, etc. frequently, then you will want to consider purchasing to use in conjunction with your pressure washer. A water broom allows you to evenly wash the surface. All you need to do is attach it to the pressure washing wand and then clean the surface. It makes cleaning flat surfaces easier without being hard on your back, because you can stand up straight and use it. It will help you get the job done quicker and easier than simply using the water wand to spray off the surface. You may think that you will get a striping affect from using the water broom. There is no striping when using because it cleans the surface evenly. The wheels on the ends take the pressure off of you, because you simply wheel it over the surface in a smooth and even motion. No striping and even cleaning. The water broom can also help you to conserve water. Less water is used because the job is done much quicker and because the water is concentrated onto the area that you are cleaning. This is great for your water bill and for the environment. If you want to clean your driveway, sidewalks, or other flat surface, but do not want to use too much water, then the water broom can make your cleaning more efficient and can help you to use less water. You can use your wand to clean your flat surfaces, but it can take you twice as long. The water broom spreads out the water to clean a wider surface area than using the wand alone. 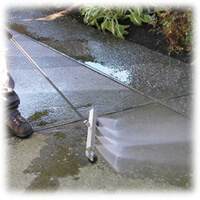 From your roof to your deck to a boat ramp, any flat surface can be cleaned with this attachment for your power washer. Being able to clean these surfaces quicker and easier will help to give you more time for those chores that you have been putting off. A water broom to use in conjunction with your power washer can save you valuable time, energy, and water. You will be amazed at how easy it is to clean a flat surface. It will move along on your surface cleaning the area in a smooth and even fashion. You can use your wand to clean your flat surfaces, but it can take you twice as long. The water broom spreads out the water to clean a wider surface area than using the wand alone. From your roof to your deck to a boat ramp, any flat surface can be cleaned with this water broom attachment for your power washer. Being able to clean these surfaces quicker and easier will help to give you more time for those chores that you have been putting off. A water broom to use in conjunction with your power washer can save you valuable time, energy, and water. You will be amazed at how easy it is to clean a flat surface with the water broom. It will move along on your surface cleaning the area in a smooth and even fashion. If you clean flat surfaces like boat ramps, sidewalks, driveways, parking lots, warehouses, etc., then you will want to consider purchasing a water broom. You will be glad you did. Benefits of using a small water broom. No need for a ladder! Easy to reach high areas.